Beefeater London Dry Gin is a popular Gin available from Tesco Groceries in 70cl to buy online. Visit Tesco Groceries for the best price for 70cl of Beefeater London Dry Gin or compare prices on our other Gin products. James Burrough launched Beefeater London Dry Gin 1876 as to this day it is the it is one of the most known well gins in the world. Adored by Martini fans it iconic design and taste have remained the same for generations. Eight botanicals are used in its creation, juniper understandably being at the forefront of the flavours along with spice of coriander and citrus notes. This quintessentially “English” product is undoubtedly a Bring a Bottle essential buy. Where to buy Beefeater London Dry Gin ? Beefeater London Dry Gin Supermarkets & Stockists. 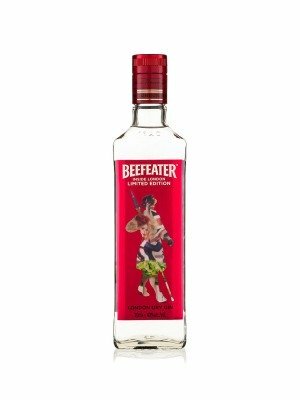 You can buy Beefeater London Dry Gin online in most retailers and find it in the Gin aisle in supermarkets but we found the best deals online for Beefeater London Dry Gin in Tesco Groceries, DrinkSupermarket.com, 31dover.com, TheDrinkShop, Waitrose Cellar, and others. Compare the current price of Beefeater London Dry Gin in 70cl size in the table of offers below. Simply click on the button to order Beefeater London Dry Gin online now.